Do you know your rights on the road? Laws at the local and state levels protect you, whether you are traveling by bike or by foot. From dooring to road position, knowing your rights allows you to ride safely and legally. Enforcement and education are vital for a region determined to be safe for bicyclists and pedestrians. The state of Illinois and the city of Chicago have extensive legal language about bicyclists' rights on the road. Read about your rights outlined in the Illinois statutes and the City of Chicago Municipal Code. Chicago passed an ordinance that further protected bicyclists. 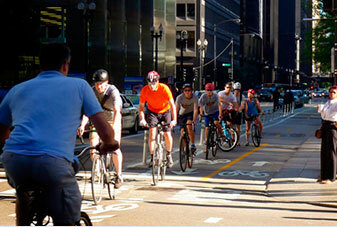 Read the details about the Chicago Bike Safety Ordinances. Some light reading: If you are a brave soul and want to read the entire Illinois Vehicle Code, go right ahead. And if that's not enough, you can browse the entire Municipal Code of Chicago.